The alleged telephone taping records in the 2G scam may not play much of a role in the CBI’s probe. CBI director Ashwini Kumar hinted at it while talking to the mediapersons at the CBI here yesterday. Prime Minister Manmohan Singh today called for the creation of lasting cultural assets in the memory of Gurudev Rabindra Nath Tagore. Chairing the first meeting of the National Committee to Commemorate 150th birth anniversary of Tagore in the capital, he hoped to receive proposals for celebrations from states other than West Bengal. Senior CPM leaders Sitaram Yechury and Basudeb Acharia yesterday dared Trinamool Congress chief Mamata Banerjee to make pubic her “secret information” that the Left Front in West Bengal would use police forces to stoke communal riots in the state in the run-up to municipal elections there. The Confederation of Newspapers and News Agencies Employees Organisations today warned the government of a nation-wide agitation from May 24, if no announcement is made regarding the extension of wage boards for journalists and non-journalists by that date. As many as 27 out of 1,846 encounters by the police of different states were fake, as disposed of by country’s premier human rights watchdog National Human Rights Commission (NHRC). Delhi Chief Minister Sheila Dikshit today said the Union Home Ministry would decide on the file pertaining to Parliament attack convict Afzal Guru's mercy petition. A Delhi judge hearing a 1984 anti-Sikh riots’ case involving senior Congress leader Sajjan Kumar recused himself from hearing the case, citing personal reasons. Even as the Congress is maintaining a wait and watch policy on Jharkhand, the BJP appears clueless on the happenings in the state, with reports emanating from Ranchi indicating a split in the ruling JMM over supporting a BJP-led government. The Railway headquarters here has received a letter purportedly written by Maoists threatening to blow up the Rail Bhawan along with other vital railway establishments, prompting authorities to step up security. In the first fallout of the Dantewada massacre of CRPF by Maoists, the CRPF today shunted out Deputy Inspector General Nalin Prabhat and two other officers for their alleged lapses. A Delhi court today denied bail to the Madhuri Gupta, a junior diplomat posted at the Indian High Commission in Islamabad and arrested for allegedly spying for Pakistan and passing classified information to its officials. Giving no relief to 53-year-old spinster Gupta, Chief Metropolitan Magistrate Kaveri Baweja dismissed her bail application saying the charges leveled against her were very grave in nature. Girls have done it again. They outscored boys by a big margin in the Class XII results announced by the CBSE today even as the overall pass percentage of students went down about 1 per cent compared to last year. The pass percentage of girls stood at 85.28, leaving boys way behind at 75.90 per cent, according to the statistics released by the board. The pass percentage for regular students is 81.95, while it is 41.99 per cent for those who pursued studies through correspondence. With an eye on next Assembly poll, the Shiromani Akali Dal (SAD), which is into its fourth year in office, has come up with a novel idea to please party cadres. It may, though, not please the babus. Bollywood actor Hrithik Roshan has found himself in the middle of another controversy as a Shirdi hotel has run into trouble with the authorities for letting the actor land his helicopter on their lawn. Former Madhya Pradesh Revenue Minister and BJP MLA Kamal Patel has been arrested by the CBI here for allegedly destroying evidence related to a murder case in which his son's name figured, CBI officials said today. Akhil Bharatiya Gorkha League (ABGL) president Madan Tamang was stabbed to death allegedly by Gorkha Janamukti Morcha (GJM) supporters around 10 am at a public meeting in the busy Chakbazar area in Darjeeling today. The news of the death led to a spontaneous shutdown in the region. Forest personnel in Kaziranga National Park (KNP), the famous abode of one-horned rhinoceros, gunned down four poachers in the wee hours today and recovered a .303 rifle and five rounds of ammunition from their possession. At least 23 persons were killed and normal life was thrown out of gear as coastal Andhra Pradesh reeled under the devastating impact of the tropical cyclone Laila, which is now headed for Orissa. When asked if the agency would consider a PR firm CEO Nira Radia’s alleged telephone conversation recorded by the Income Tax Department’s investigation as evidence, Kumar said media should first check if the conversations were made in the period under investigation. He did not make a categorical answer but added: “We will also have to see if these tapes are relevant to our investigation or not.” The 2G spectrum has been rocking the UPA government for long with the Opposition demanding resignation of Telecommunication Minister A Raja for his alleged involvement in it. The recent Parliament session witnessed continuous uproar over this issue. Raja was the Telecommunication Minister in the previous UPA regime too when 2G spectrum was allotted on “first-come-first-served” basis. The procedure had yielded the government Rs 1,600 crore. Interestingly, the auction of the 3G spectrum, which ended on Thursday, yielded the government Rs 67,000 crore. The Opposition has been alleging that the 2G spectrum was not auction and was given to industry players for a song. The CBI chief said: “Our investigation is confined to a specific period of time.” A section of media, on the basis of the “leaked” taped conversation of Radia, had recently reported that she had influenced the 2G allocation to favour some particular mobile players due to her alleged proximity with Raja. It is alleged that he state exchequer had suffered huge losses due to inordinate delay in the allocation of 2G spectrum and names of many bureaucrats also cropped up for their alleged role in the scam. Unofficial estimates put the extent of scam to a whopping Rs 60,000 crore. The CBI chief said they had asked the Comptroller and Auditor General of India to set-up a team to “go into the audit part” due to the scam’s wide financial dimensions. The first set of suggestions to the Implementation Committee on the commemoration has come from the Left Front-ruled West Bengal, which also sought the government’s intervention to prevent scheduled auction of Tagore’s paintings at Sotheby’s. The matter was raised again day by West Bengal culture and information minister Soumendranath Bera who represented the chief minister at the meeting at 7, Race Course Road attended, among others, by UPA chief Sonia Gandhi, Finance Minister Pranab Mukherjee (he heads the implementation committee) and HRD Minister Kapil Sibal. The government said it could not offer knee-jerk reactions on the auction issue as the same wasn’t covered under the existing Antiquities Act, amendments to which were being worked out. Union Culture Secretary Jawahar Sircar is learnt to have said that the government would follow rules in the matter to look at the possible ways out. The Centre has received West Bengal CM’s letter in the matter, he said.Meanwhile, West Bengal has proposed to the committee the renovation of Tagore’s ancestral house at Jorasanko in Kolkata and the matter is under consideration, Pranab Mukherjee said. The PM wanted every state to pitch in. “I understand the first set of proposals have come mainly from West Bengal. I suggest we encourage proposals from different corners of the country,” he said. The PM called for a national competition to select designs for these structures. He also told the Implementation Committee to establish new auditoria in cities where there were needed. Sonia in attendance, the PM remembered Nehru and the then Education Minister Prof Humayun Kabir’s programme to build auditoria like Rabindra Rangashala, and asked the planners to take a cue from the leaders. This decision was taken during an emergency meeting of confederation leaders, which was held this afternoon. The leaders said they would be left with no other option but to launch a nation-wide agitation, if the government did not give an extension to the existing wage boards till the end of this year. "If the government fails to accept our just demand by May 23, then we would be forced to observe May 24 as a day of betrayal by the UPA government against the interest of newspapers and news agencies employees," general secretary of the confederation M S Yadav said. Yadav also said working journalists would attend Prime Minister Manmohan Singh's press conference on May 24, wearing black arm bands and protests would also be held in various state capitals. NHRC said they had registered 2,956 cases in connection with police encounters in different parts of the country till April, since its inception on October 12, 1993. These included 1,590 cases registered on basis of the information received from the public authorities about the police encounters and 1,366 cases registered on complaints received from public alleging fake encounter by the police. Examining various reports and material on record sought by the NHRC through its notices to the public authorities, the commission has concluded that 27 encounters were fake. The NHRC has disposed of 1,846 cases, while 1,110 cases were still at different stages of consideration in the commission. “The Home Ministry will decide on the issue.... We have sent the file to Lt Governor for further action,” Dikshit told reporters when asked about the next course of action regarding Afzal's mercy petition. She said the Lt Governor Tejendra Khanna would put his view on the mercy petition and then the file would be sent to the Home Ministry. On Wednesday, the Delhi Government had sent the file on Afzal to Khanna, unambiguously backing capital punishment for the convict. But at the same time, the Delhi Government had asked the Centre to take care of the law and order situation while carrying out the execution here. Vice-President M Hamid Ansari and Prime Minister Manmohan Singh were among those who paid floral tributes to the late leader at Veer Bhumi, his memorial, here this morning. Rajiv Gandhi’s widow and Congress president Sonia Gandhi visited Veer Bhumi along with son Rahul, daughter Priyanka and other members of her family. Besides, Home Minister P Chidambaram, Defence Minister AK Antony, Congress MPs and other leaders were present there. 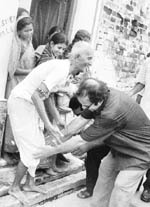 Rajiv, son of former Prime Minister Indira Gandhi, was assassinated by the Liberation Tigers of Tamil Eelam (LTTE) in Sriperumbudur near Chennai during an election rally on May 21, 1991. He became the youngest Prime Minister of the country at the age of 40, soon after his mother was assassinated by her bodyguards in 1984. Additional Sessions Judge VK Goyal has now sent the case, in which the police never filed a chargesheet allegedly to help Sajjan, to District Judge. He was expected to deliver the order on a prosecution application, seeking direction with regard to the chargesheet prepared by the police against Sajjan but never submitted before a judicial officer. “Due to some personal reasons, I do not want to try and adjudicate this matter. Let the file be placed before learned District Judge VIII with a request to transfer the same to some other court of competent jurisdiction,” Goyal said. The court directed the parties to appear before the District Judge on May 24. On April 21, the prosecution had said before the court that the chargesheet against the former MP was prepared but never brought before a judge. Instead, the FIR was clubbed with other riots cases in which the trials were already going on before the court, Special Public Prosecutor BS Joon had said. Senior counsel HS Phoolka, appearing for the riot victims, had said the chargesheet should be filed before the court concerned and summons be issued against the accused to face trial. According to information, only six MLAs supposedly owing allegiance to Chief Minister Shibu Soren’s son Hemant Soren arrived at Bokaro, where the Sorens have gone to observe the first death anniversary of Shibu’s elder son Durga who died last year. The JMM has 18 members in the state Assembly. Shibu had decided to utilise the occasion to discuss with his MLAs and party leaders the agreement reached between BJP general secretary Arjun Munda and Hemant Soren to replace him (Soren Senior) with Munda on May 25, thus requiring Shibu Soren to resign and JMM offering support to a BJP-led government. However, reports indicated that a number of JMM MLAs, as also the Chief Minister himself, who is not yet a member of the legislative assembly, are opposed to handing over the reins of power to the BJP, even on rotational a basis, as agreed upon by Munda and Hemant Soren. Two JMM MLAs consistently opposed to the move to install a BJP-led government, Teklal Mahto and Lobin Hembrom, arrived here last night and sent emissaries to the Congress leadership to start dialogue for a possible tie-up. The duo claimed that by tomorrow another four MLAs were arriving. But AICC in charge of Jharkhand K Kesava Rao insisted that he has neither met nor is his party interested in opening any dialogue with any parties till a more clear picture emerged about the political situation. On its part, the BJP is dazed by the latest u-turn by Shibu Soren and insistence that he will not resign on May 25. Though the BJP continued to feign ignorance about the developments in Jharkhand, privately some leaders said it is time that the party announced withdrawal of support. Sources in the BJP said no decision is likely to be taken on this issue at least till May 27 when BJP president Nitin Gadkari returns from his foreign tour. In any case, the party is too embarrassed to speak about Jharkhand at all. “A threatening letter, addressed to chairman, Railway Board (CRB), was received a couple of days back,” a source in the Railway Ministry said today. The letter, claimed to have been written by Maoists, threatened that vital rail establishments, like the Rail Bhawan that is located next to Parliament and the Baroda House situated near India Gate, would be blown up, the source added. While the letter is being examined for its authenticity, “precautionary measures” have been taken at these establishments. CRPF Director General Vikram Srivastava told PTI that the decision had been taken “after considering the E Rammohan Committee report and the court of inquiry conducted by the CRPF.” Besides 42-year-old Prabhat, a 1993 batch IPS officer of Andhra Pradesh cadre, the other two officials who have been sent out are Commandant AK Bisht and Inspector Sanjeev Bangre, he said. While Prabhat will be joining in Chandigarh, a charge he was already holding, Bisht has been moved to a training centre Aradi in Orissa. Bangre has been shifted to Anantnag in Kashmir. The prosecution said she passed information to the neighboring country from her email account through blackberry with a Pakistan SIM card. There are also allegations of a deposit of Rs 1 lac cash in her bank account during this period. In her bail plea, Gupta, facing serious charges under the Official Secrets Act, had submitted that she was no more required by the police for further investigation and that no fruitful purpose would be served by keeping her behind bars. The bail plea was strongly opposed by the Additional Public Prosecutor Rita Sharma on the ground that some officials were yet to be examined by the investigators and her release could be detrimental to the probe. Sharma said forensic and other reports of five computers seized from her office and residence in Islamabad were still awaited. With results of all six regions out now, Chennai is on the top, scoring a success rate of 92.17 per cent while Delhi is at a distant second with 84.97 per cent. Students of private schools might have hogged the top few positions but what should be heartening for many is that Central government-run Jawahar Navodaya Vidyalayas and Kendriya Vidyalayas have beaten public schools thoroughly in the overall success story. Amidst the general decline, 95.31 per cent of the students of the Navodaya have cleared the exam, an improvement from last year's 94.09 per cent. A total of 699,129 students — 408,367 boys and 290,762 girls — took the Class XII board exams in the country and abroad. As it announced the results, the CBSE also launched post-result psychological counselling for students through tele-helpline, Interactive Voice Response System and its website. The party is preparing a list of workers, who would be in “direct touch” with the deputy commissioners in the state. The move that has got a go-ahead from Deputy Chief Minister Sukhbir Singh Badal comes after SAD workers complained to him that the bureaucracy was not listening to them. The ‘identified’ party workers will hold review meetings every month to ascertain the progress on work recommended by them to the bureaucrats. Party workers have been assured that feedback on their recommendations will be taken from officers in front of them. However, the Deputy CM said the system is being instituted for the people and the party men should approach officers for development works only. Badal Junior said he would also take feedback on what kind of work was recommended by workers to ensure that the facility is not misused. At the two-day party meeting which concluded here today, SAD leaders said the workers are responsible for getting votes polled and it was necessary to boost heir morale by telling them that they would be listened to in the corridors of power. Meanwhile, in another significant development, the SAD has decided to form a 1,000-strong brigade of active workers in all 117 constituencies to assist the party in the coming Assembly elections. The Deputy CM is taking a keen interest in formation of this brigade that sources said “will be directly visible to the people”. The party, however, will only choose workers, who have a clean image as members of this core group. The party has also decided to strengthen its various wings. It was noted that the farmer wing of the party, which is headed by senior leader Balwinder Singh Bhunder, is not visible and did not stand up to farmer organisations during the agitation over unbundling of the state electricity utility. It was felt that the NRI wing, which is headed by former legislator Surjit Singh Rakhra, also needed to be strengthened. Other wings, which the party hopes to rev up in the coming months, include the backward castes wing and the scheduled castes wing. The SAD, meanwhile, disclosed that the organisational structure would be revamped by July 15 and that 50 per cent of the new officer-bearers would include elected members of Panchyati Raj institutions. The collector of Ahmednagar district has issued a notice to hotel Sun-N-Sand for not seeking the district authorities' permission before allowing the landing of the helicopter. Hrithik came to Shirdi with his family to pray for the success of his film “Kites,” which released today. Hrithik was mobbed by the media and soon lost his cool and the actor faced a backlash for misbehaving with the mediapersons. Patel, an MLA from Harda constituency, was questioned by the CBI, after which he was arrested last night, they said. Patel alleged the CBI was trying to implicate him. "I am innocent in the case and the CBI is falsely trying to implicate me," Patel told reporters before leaving for Indore, where he will be produced in a CBI court. The BJP MLA was arrested in connection with the murder of Durgesh Jat on March 5, 2008, at the farm house of Congress leader Rajendra Patel in Deotalao. Tamang was sitting in a chair on the dais and was about to get up to address the gathering, when a group of people, carrying khukris, lathis and other sharp weapons, attacked him from the back and stabbed him repeatedly on the chest and throat. The critically injured ABGL leader succumbed to his injuries on way to a hospital in Siliguri. Tamang, a vocal opponent of the GJM, had earlier levelled corruption charges against its chief Bimal Gurung. The GJM had then threatened to banish him from the hills. State Municipal Affairs Minister Ashok Bhattacharya said in Kolkata that GJM supporters had carried out the attack on Tamang. "The GJM's goons have committed the murder. The GJM is a fascist party, which does not want any opposition in the hills. They are opposed to a democratic atmosphere prevailing in the hills," he said. "We are deeply concerned. The hills are very tense," said Bhattacharya, who hails from Siliguri in Darjeeling district. A spontaneous bandh was observed soon after the killing at Darjeeling and two other subdivisions at Kurseong and Kalimpong. Agitated ABGL, BJP and CPI(M) supporters came out in the streets in large numbers to protest against the brutal killing of Tamang. 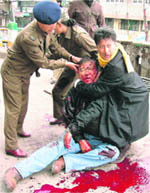 They demanded the arrest of Bimal Gurung and other GJM leaders for the “killing” of Tamang. They also burnt effigies of Gurung and other GJM leaders. The police dispersed the mob by firing in the air and throwing tear-gas shells. Tension prevailed in the area and the paramilitary forces were called in to patrol the streets. Special police pickets have been set up in vulnerable areas as a precautionary measure. The IG( north Bengal), K.L. Tamta, left for Darjeeling with a large contingent of para-military forces from Jalpaiguri to maintain law and order in the hills. Fiftythree-year-old Tamang had been opposing the GJM bandhs and agitations in the hills. He was also demanding a separate statehood but not through bandhs and agitations. The CPI(M) and the BJP were supporting Tamang’s peaceful movement in the hills. KNP director Surajit Dutta said a gang of about six poachers, which was trailing a rhino, came face to face with a forest patrol between Bokpara and Mihimukh under Kohora range of the park and four poachers were killed in the ensuing encounter at about 2 a.m.While the bodies of two poachers were recovered immediately after the encounter, those of as many others were found in the morning. Rains and powerful winds triggered by Laila lashed Orissa's winding coast today. The storm was centred near Machilipatnam in Andhra Pradesh early in the day, said the Bhubaneswar meteorological centre. It is expected to hit the state. Orissa has been lashed by rains since last evening. Gopalpur town in Ganjam district and Puri have received about 4 cm of rains. The authorities have evacuated nearly 4,000 people from three villages near the sea at Gopalpur fearing the area could be worst hit by the sea surges. A day after the cyclone hit coastal Andhra and left a trail of death and destruction, the authorities began assessing the damages in 11 coastal districts and reaching out to the victims. As torrential rains battered the region under the influence of severe storm, seven deaths were reported from Krishna, five from Prakasam and four each from Nellore and Guntur districts since yesterday. Two persons died in East Godavari district, while Visakhapatnam district accounted for one death. Three more persons were reported missing in East Godavari district, the officials of the state disaster management department said. Over 6,000 hectares of land with agricultural crops, spread over five districts, and an equal extent with horticultural crops was completely damaged, state Revenue Minister D Prasada Rao said after a high-level review meeting chaired by Chief Minister K Rosaiah here. The cyclone wreaked havoc in the coastal region, uprooting trees, snapping power lines and damaging roads and communication networks. Power supply to over 1,000 villages was affected and 108 power sub-stations were damaged. reported at Krishna, East and West Godavari districts. By tomorrow, the deep depression is expected to enter Orissa, where it is expected to weaken further before making its entry into West Bengal. “According to numerical weather prediction model, there is possibility of emergence of the system into the north Bay of Bengal. In that case, the system may intensify again over the sea,” the IMD said in a statement. Over 71,000 people from low-lying areas have been shifted to 300 relief camps. The Chief Minister appealed to them not to leave the camps and return to their homes till complete normalcy was restored. Rosaiah held a teleconference with collectors of the coastal districts and asked them to be on maximum alert as there was a threat of heavy to very heavy rainfall in the region over the next two to three days.